Continuing my dissection of Mississippi State's defense against Auburn, I want to take another look at a screen pass example. 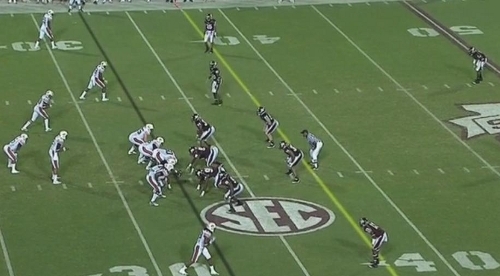 As I've mentioned several times now, the Bulldogs' defensive alignment was schematically unsound against Auburn's 3x1 alignment. One of the ways they counteracted this was to send their playside linebacker directly at the H receiver (who runs the screen route). In the other example today, Auburn sent their strongside receivers downfield and allowed Cam Newton to make the proper read: throw the screen pass or hit one of the outside receivers on a seam route. 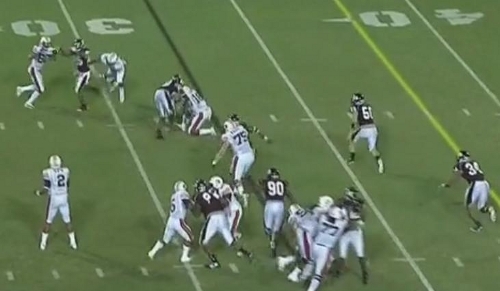 In this example, however, they ran an all-out screen pass that almost resulted in catastrophe. 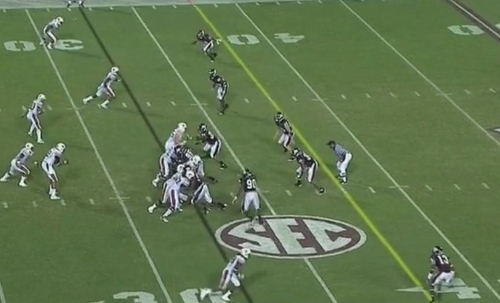 Auburn is in the 3x1 formation they'd shown all game. 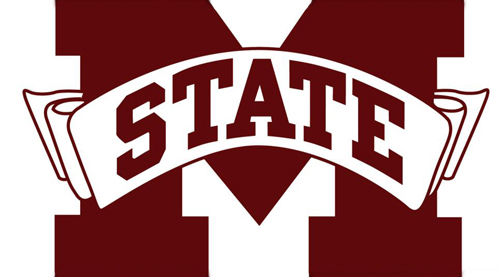 Mississippi State is once again in their base 4-3 set with two stand-up DEs and the strongside linebacker shaded over the slot receiver. The difference between this defensive alignment and the previous one is that Mississippi State's strongside cornerback is closer to the line of scrimmage. 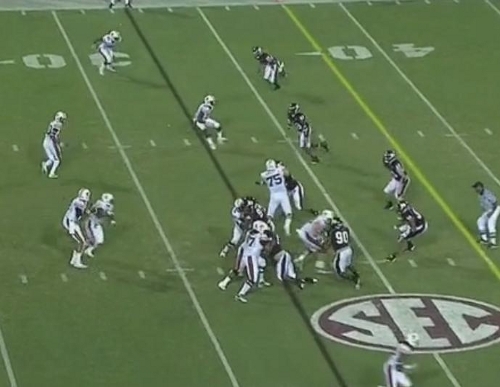 On the snap, the H receiver starts to bow out for the screen pass. Newton is going to run a play-action in the backfield. You can see the playside cornerback crashing down on the screen pass. The X and Y receivers are headed upfield to block the playside linebacker and cornerback. Newton is engaged in the play-action mesh and about to pull the ball. It looks like he's reading the playside cornerback, but that seems unlikely given the throw he makes. The interesting part about this play is that the wide receivers don't appear to have the same option that they did in the previous play; they're strictly blockers in this play. ...but the cornerback can't quite get a hold of the ball and it falls harmlessly incomplete. As I mentioned in the comments of the Mississippi State NCAA rankings post, this is a high variance play: if the cornerback makes this interception, it's a pick-6 unless Newton can catch a streaking cornerback. If this pass somehow gets through, or if Auburn's receivers run vertical routes like they did earlier, this is almost certainly a touchdown. Instead, the ball falls harmlessly and we get a look at how Mississippi State tries to defend a screen pass in a structurally unsound formation. The philosophy behind this play is more revealing than the result of the play. 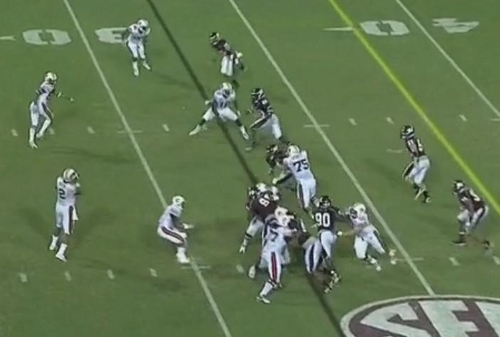 This was much later in the game after the Bulldogs had been burned multiple times by the screen pass. But instead of shifting their alignment to limit or remove the screen option, they decide to stay within their base formation and attack more aggressively, which tells you something about the Mississippi State defensive coordinator. Michigan has thrived on exploiting opponents' aggressiveness this year. The coaches have enough film on this defense to formulate an attack plan against plays like this. Again, unless the defensive alignment shifts later in the year, Michigan is going to show a lot of 3x1 offensive formations against Mississippi State. I'd also expect that, in most instances, Michigan's outside receivers are either going to be given an option route (block if the playside defenders stay home, run routes if they crash on the screen pass) or be told to run routes upfield. This defensive alignment is similar to what Michigan saw against Notre Dame: a strict 4-3 and a coordinator too stubborn to change his personnel when the offensive alignment warrants it. Michigan should be able to exploit this throughout the game, that is unless Mississippi State's defensive alignment becomes more malleable throughout the year, which is pretty likely. I'll be sure to keep an eye out for this in other Mississippi State games.